Prepare yourself for the unbridled horror... of marketing synergy. The HorrorHound is said to be a werecreature of scientific origins, a mutant byproduct of Nazi experimentation and supernatural hybridization. This former Allied soldier is cursed to wander the lonely woodlands and byways of Ohio's Devil's Backbone. While it's a cool design, the HorrorHound isn't a legit cryptid. It's the mascot of HorrorHound Magazine, complete with its own little backstory and everything. But who cares? This is a toy of a Nazi Frankenwolf, so let's dive right in! Unlike my confusion with the sasquatch and the yeti, who did not share any pieces, the HorrorHound uses many of the same molds as the rougarou: Aitch-Aitch gets a new torso, new wrists, and a new right lower thigh, but the rest - the arms, the hands, the majority of the legs - are the same as the other Creatureplica werewolf. The wrists and thigh are new because they needed to be sculpted with large metal sutures, and the torso is new because so many wounds! 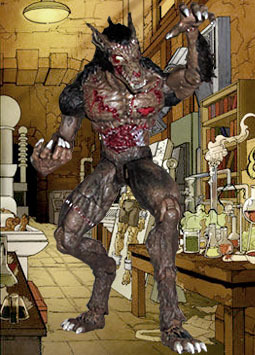 While the hands (and right leg) have been sewn (or stapled) on from another creature (here's something to ponder: was the HorrorHound put together from parts of multiple werewolves, or did the infection spread from one of his bodyparts? Does he turn back into a regular Frankenstein when the moon's not full, or is he a wolf all the time? ), the chest is just a complete mess. There are more big ugly stitches scattered about, patches of missing skin, and numerous bullet holes. Also, the stomach is ripped open, revealing ribs and viscera. The HorrorHound head is new as well. It's not quite skeletal, but it's definitely not fully fleshed, either. The nose is gone, leaving just a hole in the snout, and there are no flews to cover his fangs. Apparently the face is another piece that came from a different donor, because more staples hold it onto the rest of the head. Most of the HorrorHound's body is brown, though there's shading to bring out his muscles. The stitches are, as we've said, silver, and all his wounds are a lovely dark red. He has blank yellow eyes and gray claws. The fur on his elbows, shoulders, neck and head is all a dark grey, nearly black, which keeps the puppy from turning into a featureless mess. You don't get paint this nice on mass market toys any more, so it's nice to see specialty offerings keeping it alive. Reused body means reused articulation. The HorrorHound has swivel/hinge toes, hinged ankles, hinged knees, swivel thighs, swivel/hinge H-hips, a swivel waist, swivel torso, swivel/hinge wrists, hinged elbows, swivel biceps, swivel/hinge shoulders, and a balljointed head and neck. He sadly does not share the Louisiana Rougarou's hinged jaw or swivel ears, and we'd still prefer a balljoint or a hinge for the chest rather than a second swivel. On the plus side, the ratchets in the joints are nice and stiff, and will keep him standing despite his weight. Good news, everyone! Also to keep him standing, he includes a display base, just like the rest of the Creatureplicae. 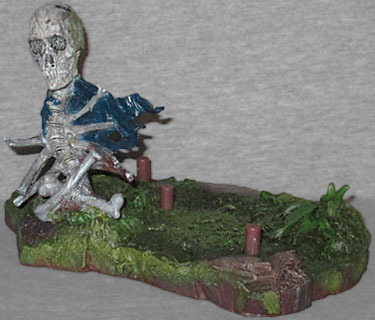 In keeping with the re-use seen on the figure's body, this base is the same as the Rougarou's Louisianna swamp, just turned around backwards and painted with different colors. 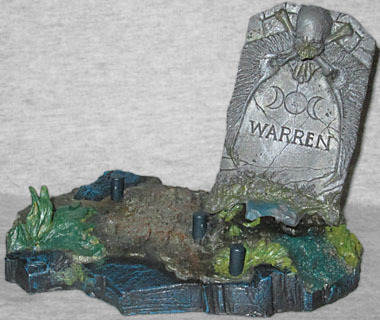 Instead of a skeleton, this one has a fancy tombstone with his name on it. The stone is decorated with a skull, crossed bones, and wings pointed downward. There are numerous cracks on the surface, and the symbol on the center represents the phases of the moon. All the Creatureplica figures are expensive, but that doesn't mean they're not worth getting. 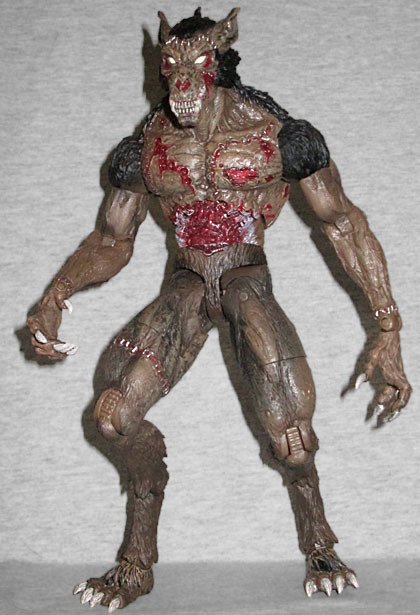 Look at it this way: remember when Stan Winston Creatures was releasing toys, and we all complained about the price of them (they literally cost an unthinkably awful $15 apiece, you guys! ), despite their large size, impressive sculpts and complex paint apps? I decided I'd rather get these figures now at retail price, rather than have to pay two or three times more on the secondary market later. The HorrorHound may not have the pedigree of the other monsters, and he may just be the equivalent of an Alfred E. Neuman or Eustace Tilley action figure (with less cultural impact), but does that really matter? 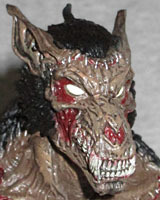 Who else but Jean St.Jean is ever going to make you an action figure of a Nazi Frankenwolf?